The riverside capital of Laos, Vientiane still has a relatively small urban area and a laid-back, relaxed feel to it. On the 9th (Sat), make a trip to Patuxai, pause for some photo ops at Black Stupa (That Dam), then take in the spiritual surroundings of Wat Si Saket, then take in the spiritual surroundings of Wat Si Muang, and finally steep yourself in history at Great Sacred Stupa (Pha That Luang). For other places to visit, traveler tips, more things to do, and other tourist information, you can read our Vientiane trip maker tool . Singapore, Singapore to Vientiane is an approximately 4-hour flight. You can also drive; or do a combination of bus, train, and car. The time zone difference when traveling from Singapore to Vientiane is minus 1 hour. In June in Vientiane, expect temperatures between 39°C during the day and 30°C at night. Wrap up your sightseeing on the 10th (Sun) early enough to travel to Champasak Town. Near the borders of Thailand and Japan in southern Laos, the small town of Champasak is best known for its UNESCO-protected ruins. Kick off your visit on the 10th (Sun): look for gifts at Chez Maman and then don't miss a visit to Wat Phu. To see other places to visit, where to stay, ratings, and more tourist information, go to the Champasak Town trip itinerary app . Traveling by combination of flight and taxi from Vientiane to Champasak Town takes 2 hours. Alternatively, you can drive; or do a combination of bus and taxi. June in Champasak Town sees daily highs of 37°C and lows of 30°C at night. Finish up your sightseeing early on the 10th (Sun) so you can go by car to Don Khong. On the 11th (Mon), take in the pleasant sights at Don Khone Island and then take in the dramatic scenery at Khone Phapheng Waterfall. To see ratings, where to stay, reviews, and more tourist information, refer to the Don Khong driving holiday planner. Drive from Champasak Town to Don Khong in 3 hours. Finish your sightseeing early on the 12th (Tue) so you can travel to Sayaboury. 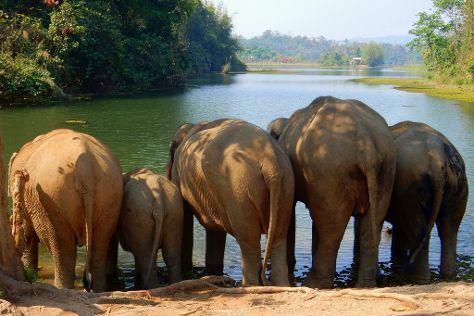 Sayabouru, a northern Laotian town and capital of the eponymous province, remains best known for its main attraction, the Elephant Conservation Center. Plan trip to Sayaboury with our itinerary maker to find out where to go and what to do. Traveling by combination of taxi and flight from Don Khong to Sayaboury takes 7 hours. Alternatively, you can drive; or do a combination of car and bus. In June, daytime highs in Sayaboury are 38°C, while nighttime lows are 28°C. Wrap up your sightseeing on the 13th (Wed) to allow time to drive to Luang Prabang. Designated a World Heritage Site in 1995, Luang Prabang sits at the meeting point of two rivers and offers numerous opportunities for sailing, climbing, and exploring scenic caves and waterfalls. Popular historic sites such as Golden City Temple (Wat Xieng Thong) and Wat Mai Suwannaphumaham are in your itinerary. Attractions like Nahm Dong Park and Kuang Si Falls Butterfly Park make great kid-friendly stops. The adventure continues: relax in the rural setting at The Living Land Company, get engrossed in the history at Traditional Arts and Ethnology Centre, make a trip to Alms Giving Ceremony, and get lost in a book at Luang Prabang Library. To find out how to plan a trip to Luang Prabang, use our trip itinerary maker. Traveling by car from Sayaboury to Luang Prabang takes 3 hours. Alternatively, you can do a combination of taxi and bus. In June, daytime highs in Luang Prabang are 39°C, while nighttime lows are 28°C. Cap off your sightseeing on the 17th (Sun) early enough to travel back home.